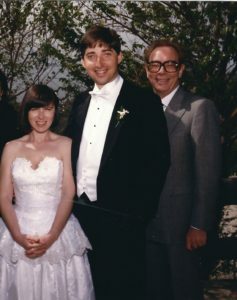 Valerie, me and Michael on my wedding day … 26 years ago. Last night I went to the memorial for my dear friend and mentor Michael Gleason, who passed away a few weeks ago. The stories his family and friends told were touching, funny and perfectly captured his personality. They sparked memories for me that I had forgotten about. The highlight (if you can say such a thing about a memorial) was a short film about his life, narrated by Michael himself from an interview conducted with him recently. It was like having him back in the room. I’ll miss that voice, that unique sense of humor, and that hearty laugh. There were a lot of famous people in the room…including TV writers like John Wilder, William Blinn, Jeff Melvoin, Brad Kern & John Wirth… and actors Pierce Brosnan, Stephanie Zimbalist, Kim Lankford, Susan Sullivan, and Jaclyn Smith. It’s remarkable how many lives he touched…and so profoundly. Here is a short essay I wrote for the memorial keepsake that was given out to family members. I am the writer I am today largely because of Michael Gleason. And in some ways, I am the man I am today because of him, too. He gave me, and my writer partner William Rabkin, our first TV staff jobs on Murphy’s Law. Michael was warm and encouraging and took an instant, fatherly interest in us. He taught us everything he knew. He brought us into casting, editing, music spotting and every other aspect of production and post-production…and gave us far more responsibility than we deserved. He became our professor of television. Our mentor. Our dear friend. Michael took us with him to lunch every day at La Serre, where he had his own table marked with his name on a brass plaque and he could schmooze with Glen Larson and all of his other industry friends. We loved it but it was bankrupting us. After a week or two, we told him that we couldn’t afford to eat like that every day. He understood. We kept eating there…but he picked up our check. You are a writer, first and foremost. Don’t fall in love with your producer credit, no matter how high you climb, or you’ll limit your opportunities. The goal is to get paid to write. The rest is gravy. Live below your means. Your show could be cancelled tomorrow… or maybe in five years…but after that you might not work for a long time, or not as often, or not get paid as well. So sock your money away. Don’t buy a Rolls Royce or build a tennis court on a cliff. Michael was full of love, creativity, and boundless energy. Nobody. NOBODY, could tell a story like he did. The stories and anecdotes were wonderful, but the real pleasure for me was the obvious joy he took in sharing them. In fact, he taught me how to pitch by insisting that I sell our episodes to the network myself. His notes on my performance would either be: “Less Gleason” or “More Gleason.” And I knew exactly what he meant. Every time I tell a story, I hear Michael Gleason in my ear. I know that I always will.